Tortillas made of zinc-enriched biofortified maize. Photo: HarvestPlus. 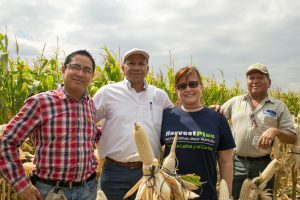 The first zinc-enriched maize varieties developed specifically for farmers in Guatemala were released this month as part of efforts to improve food and nutrition security in a country where over 46 percent of children under five suffer from chronic malnutrition. 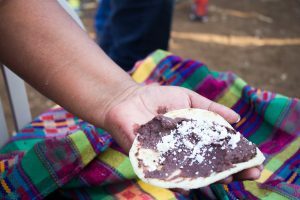 More than 40 percent of Guatemala’s rural population have been found to be deficient in zinc, an essential micronutrient that plays a crucial role in pre-natal and post-natal development, and is key to maintaining a healthy immune system. The new varieties, known as ICTA HB-18 and ICTA B-15, were developed by the International Maize and Wheat Improvement Center (CIMMYT), the CGIAR Research Programs (CRPs) on Maize (MAIZE) and Agriculture for Nutrition and Health (A4NH), and Guatemala’s Institute for Agricultural Science and Technology (ICTA), with support from HarvestPlus. The varieties will be commercialized by Semilla Nueva and Atescatel cooperative with the support of the Plataforma BioFORT, a network created to promote biofortification activities in the country formed by 30 public and private institutions. The official launch was held in Jutiapa, Guatemala, on May 4 with an event attended by over 100 Guatemalan maize producers. Felix San Vicente, second from left, at the launch event. Photo: HarvestPlus. These biofortified varieties were developed using conventional breeding methods. Farmers expressed interest in the varieties due to their high yield quality protein content, high zinc levels, early maturity and large kernel size. Maize is a staple crop in Guatemala, and the base of many traditional foods such as tortillas, tamales, fresh roasted maize ears and other products. Tortillas made with ICTA B-15 contain up to 60 percent more zinc than regular tortillas. ICTA HB-18, a zinc maize hybrid, contains 15 percent more zinc compared to commercial maize. Just 100 grams of tortilla made of these varieties can provide 2.5 milligrams of zinc, 50 percent of the daily recommended zinc intake for children, making zinc-enriched biofortified maize an excellent tool in the fight against malnutrition and hidden hunger. One hundred and thirteen tons of seed will be produced and delivered to producers by the end of 2018.